A beautiful day for the Hot Toddy. Bright and breezy as per shown in this photo taken by Aidan O D while onboard a Port and Docks tug boat (awarded a LFYC handicap of -3million). Three excellent races were held. Ciaran and Eva M were sailing very well scoring their first win and coming second overall. Well done guys. James and Alan were also sailing very well and won the Hot Toddy overall. We retired to the new club house where a BBQ was held and Hot Toddys were kindly dispensed. Many thanks to George D for the hospitality and also to Fiona and Tracy and Alan and James H for the BBQ. Great to see James J out in the club laser. Many thanks also to Liam H and Peter F who acted today and throughout the year as Coxswain and OD. 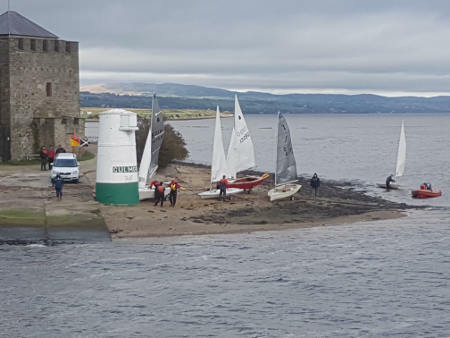 You are currently browsing the Lough Foyle Yacht Club weblog archives for November, 2018.